Description The first two humans are depicted with ideal bodies that recall ancient marble sculptures. The snake has a woman's face that resembles Eve's. During this period, women were often described as untrustworthy, and this negative idea is reflected in the gender of the face of the snake. The primary visual source for the compostion is an engraving representing Adam and Eve by the German master Albrecht Dürer and dated 1504. Besides the figures, the engraving features a dense wall of forest foliage that has been taken over by the sculptor to create a rich backdrop in relief for his figures. The German master populated the underbrush with a variety of animals, which in the sculture have been greatly reduced in number. Nevertheless, there is one detail that has tantalized scholars. The tall plants with yellow heads of grain have been interpretated by some as corn or maize from the Americas. This would indeed be remarkably early for their inclusion in European imagery; nevertheless, recent techncal examinations have concluded that the passages where this appears to be the clearest is in fact a replacement from the 1800s. The inscription on the base indicates that this is one of the many works of art made in Florence to celebrate the triumphal entrance of Pope Leo X, a member of Florence's Medici family, into the city on November 30, 1515. The central coat of arms is the pope's. To the right is that of the Salviati family, and to the left is that of the Buondelmonti family, demonstrating their support of the pope. 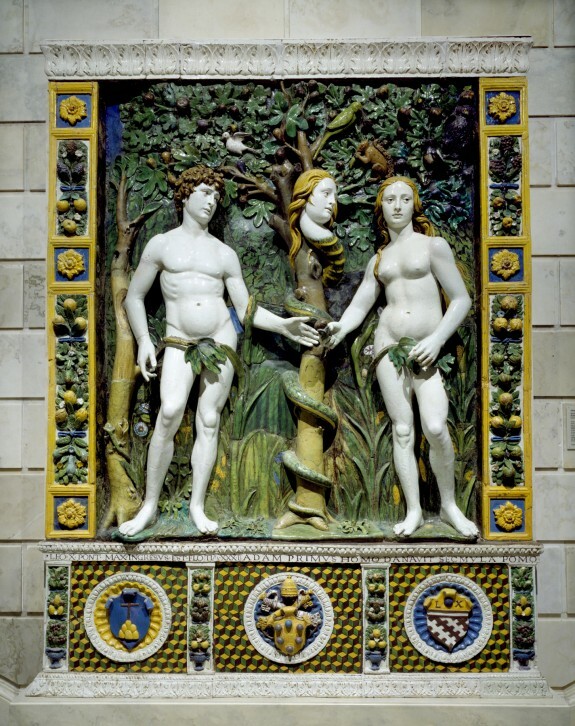 For several generations, the artists of the Della Robbia family in Florence were noted for the production of brightly colored, glazed terracottas, often produced for architectural settings. Examined to determine stability; loose joins reinforced with adhesive. Examined for condition, surfaces cleaned of dust and grime. This object was cleaned to remove dirt and grime, as well as reduce prior restoration materials that were covering original ceramic surfaces. The object was examined and analyzed to answer questions as to its authenticity and extent of prior restoration. Several broken fragments were repaired, and old painted restorations were toned to better match the original. 12/31/1969 Treatment Cleaned, examined, repaired. Provenance Mme Camille Lelong, Paris; Lelong Collection Sale, Paris, 1902, no. 98; purchased by Henry Walters, Baltimore, 1902; by bequest to Walters Art Museum, 1931 .